Everyone wants me to test drive their car. Maybe it has something to do with a new study showing that consumers are more willing to pay more for products they touch? Or maybe someone has been watching too much Yo Gabba Gabba: Try It, You'll Like It? Several brands are trying to get consumers to their dealerships to simply test drive a car with all kinds of enticements. 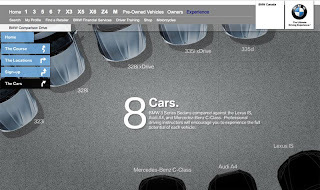 For example, BMW Canada will let you test drive eight cars – 5 BMW 3-series variations and 3 direct competitors. Drivers will be given two hours to drive the eight cars in “six real-world scenarios.” There will be full slalom, braking, and acceleration tests participants will experience with professional drivers. The event must be getting some traction as the Vancouver, British Columbia event is already full, leaving space only in Montreal and Toronto. So hurry up if you want to quickly tryout some BMWs, a Mercedes C-Class, Audi A4, and Lexus IS. I wonder what car will be most impressive? Hmmmm…. 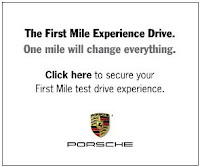 Meanwhile, Porsche has been promoting their test drive campaign, First Mile, on Yahoo! The First Mile hopes that one mile in a Porsche will convince people that it’s time to buy a Porsche. Whose horrible idea was this? One mile in a Porsche is like having foreplay with Heidi Klum going nowhere. Sure it would be fun and exhilarating but also a major let down. The Volvo XC60 team is running around the country getting people to see the Volvo in person. You can even checkout their Flickr photo stream. You can test drive it in a parking lot, and you can touch it with a bunch of marketing and dealership employees helping you understand the product’s benefits. Want to know when Volvo is coming to your town? Follow them on Twitter, of course. So get out and touch a car. Maybe you’ll want it more or you’ll pay more if you actually open a door, sit down and wrap your hands around a supple leather steering wheel. Just remember to be careful, because if you a break it you bought it.